All rotating equipment creates radial and axial forces during normal operation. These forces can lead to a catastrophic failure of the equipment, unless the proper support equipment and systems are used. The most critical is the selection of bearings and lubrication systems. Bearings are machine parts in which another part turns or slides. They have three basic functions: reduce friction, carry loads, and position moving elements. Friction is the resistance to motion that exists between two objects in contact with each other. Two significant kinds of friction that exist between surfaces in contact are rolling friction and sliding friction. Some bearings are designed to handle rolling friction, while others are designed to handle sliding friction. Rolling friction exists when one object rolls around or within another. 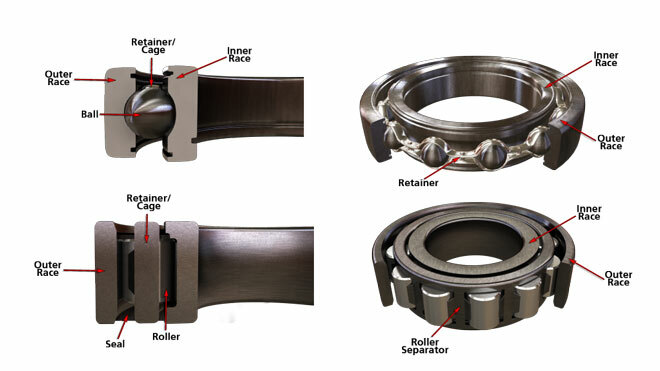 Bearings that handle rolling friction contain rolling elements, such as balls or rollers. These elements roll between rings to allow a moving part, usually a rotating shaft, to move easily. Sliding friction exists when one object slides over or across another. Bearings that handle sliding friction are built to allow a rotating shaft or other moving element to slide against the smooth surface of the bearing. The term load refers to a force or weight that is placed on a bearing. Loads are generally placed on a bearing by the shaft or other moving element. Loads can be defined as either radial loads or axial loads. In order to position a moving element, bearings are designed to resist movement in one or more directions, while allowing movement to occur in other directions. In most cases, the consequences of shaft movement other than rotation can be severe and machinery can be badly damaged if such movement occurs. 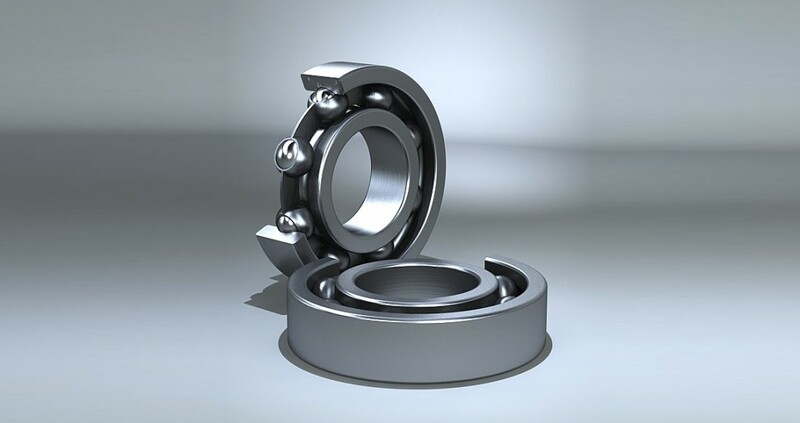 The majority of the bearings found in industry fall into one of two categories: plain bearings or antifriction bearings. There are other categories of bearings, such as magnetic bearings used for extremely high speeds, but their use is not nearly as widespread. A plain bearing is basically a cylinder that fits around a portion of a rotating shaft called the journal. The bearings are typically made of a soft material, like babbitt, that will not scratch the shaft as it slides against the bearing. Some plain bearings also use a layer of lubrication to separate the shaft and the bearing surfaces, which can blur the line between classifying them as plain or fluid bearings. Journal bearings are cylindrical surfaces that are used to support, and sometimes align, rotating shafts. Journal bearings are called partial bearings if they contact less than the whole circumference of the shaft, and full bearings if they completely surround the shaft. The two major types of journal bearings are sleeve bearings and bushings. Sleeve bearings consist of a special alloy lining bonded to a metal back or cap. 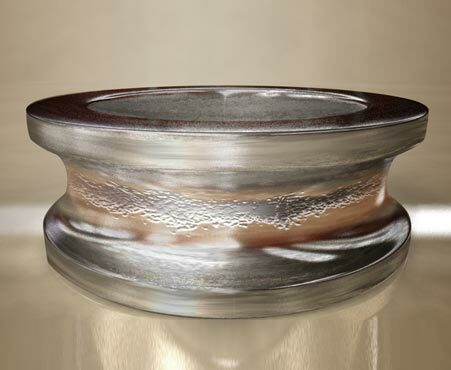 The lining is usually babbitt or bronze, while the cap is usually steel or bronze. Sleeve bearings can come precision fit to match specific shaft measurements, or unfitted, which requires the material to be bored out to the required dimensions. 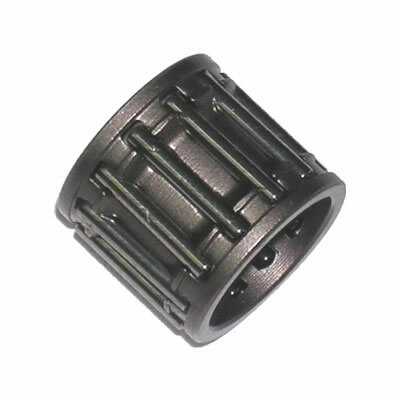 Bushings are full-round cylindrical sleeves constructed from the bearing material. They differ from sleeve bearings in that they are made entirely of the bearing material, and can be easily removed and replaced. Bushings can be constructed by being cast around a mould, by rolling out flat strips and shaping, or by compressing and heating metal powders into the desired shape. Thrust bearings are used to handle axial, or thrust, loads and to maintain the position of the rotating machinery. The thrust bearing is a stationary element with a babbitt surface. In a thrust assembly, the thrust plate with its babbitt surface is located close to a flat rotating surface on the shaft known as a thrust collar or runner. Antifriction bearings use hardened balls or rollers to carry the load and reduce friction and wear. The rolling contact causes the load to be carried by a small contact area, which generates less friction than a plain bearing. The rolling elements can also be coated with lubricant to further reduce friction. Antifriction bearings consist of the rolling elements and an inner and outer race on which the rolling elements ride. The inner race does not move relative to the shaft; it is attached to the shaft and turns as the shaft turns. A retainer, or cage, keeps the rolling elements separated to prevent them from rubbing together as they turn. The various types of ball bearings differ primarily in the shapes or depth of their inner and outer races. Three basic types of ball bearings are shallow groove ball bearings, deep groove ball bearings, and spherical race ball bearings. Shallow groove ball bearings have relatively shallow uniform grooves on the inside surfaces of their inner and outer races. Shallow groove bearings are designed primarily to handle light to moderate radial loads. Deep groove ball bearings have relatively deep uniform grooves on the inside surfaces of their inner and outer races. Deep groove ball bearings are able to handle moderately heavy radial loads and they can also handle a small amount of axial load. Spherical race ball bearings are self-aligning, and come in a single-row external-type variety and a double-roll internal-type variety. The inner race of each type has a deep groove or grooves, while the outer race has a wide, shallow, spherical groove. Roller bearings use rollers instead of balls, which allows them to spread the load over more contact area. As a result, roller bearings can generally carry more load than ball bearings. Four basic types of roller bearings are cylindrical roller bearings, tapered roller bearings, barrel roller bearings, and needle roller bearings. Cylindrical roller bearings have a relatively simple design. They contain cylindrical rollers that typically roll along flat-bottomed channels in the races. Cylindrical roller bearings primarily handle radial loads. Tapered roller bearings have rollers that are slightly smaller at one end than at the other. The tapered rollers are arranged at an angle to the shaft and the opposing surfaces of the races are set at the same angle as the rollers. Tapered roller bearings are designed to handle both radial loads and axial loads. Spherical roller bearings have rollers that are barrel-shaped, that is, thick in the middle and thinner at both ends. The outer and inner races are bowed to follow the contour of the rollers. 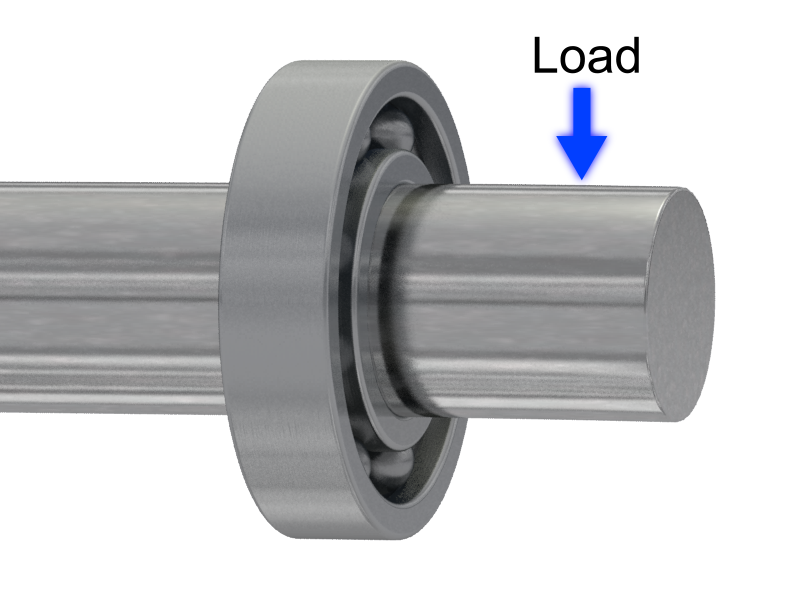 These bearings typically have two rows of barrel-shaped rollers operating in separate raceways separated by a center rib. Needle roller bearings have long, thin rollers. A needle roller bearing generally holds more rollers than a cylindrical roller bearing. The greater number of rollers enables the bearing to carry heavier radial loads. Antifriction thrust bearings can use balls, rollers, and tapered rollers to allow rotation while supporting an axial load. 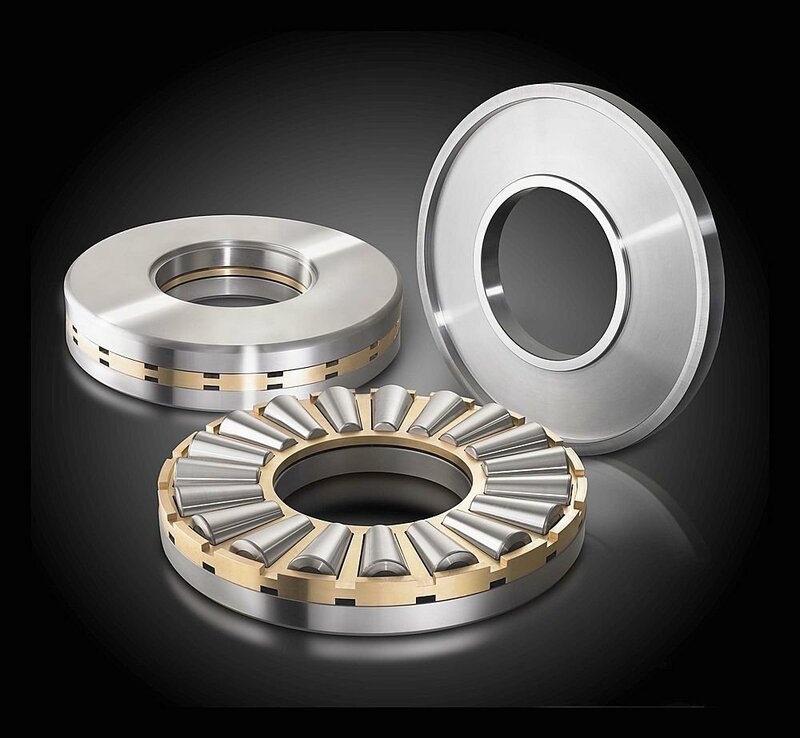 Ball thrust bearings can support the smallest amount of axial thrust, and cannot be used to support any significant radial load. Roller thrust bearings can support a good amount of thrust, but tend to wear out quickly. Tapered roller bearings can support a great deal of both axial and radial load, but are also the most expensive of the three to manufacture. Both plain and antifriction bearings can fail for a variety of reasons. Although bearings will wear normally over time, mistakes made by the installing or maintenance technician account for a majority of bearing failures. Metal fatigue failure is caused by the stress of loads and vibration on a bearing. This stress causes the bearing metal to flex and bend, which weakens the metal. The bearing surface begins to break up, and it becomes rough. This leads to increased vibration and results in excessively high operating temperatures. Improper lubrication can be caused by using the wrong amount of lubricant or the wrong kind of lubricant. Lubricant that is contaminated with foreign matter can also lead to bearing failure. Too little lubricant can prevent a proper film from building up between the surfaces of the shaft and the bearing. If the proper lubricant film is not present, contact between the shaft and the bearing will cause the bearing to wear out quickly and fail. Using the incorrect lubricant can refer to using grease or oil when the other is called for, adding additional lubricant that is incompatible with the current lubricant, and selecting a lubricant without taking the application into account. Contaminants in the lubricant, such as particles of metal or dirt, can get between moving components. As the shaft turns, these particles can scratch and score the bearing surface or races. Misalignment can lead to excessive heat generation and rapid damage to bearing components. Misalignment can occur when the shaft does not pass through the bearing squarely, or due to improper maintenance leading to misalignment of the outer race. 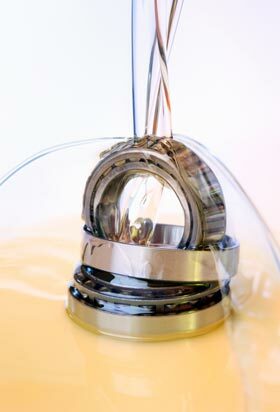 To learn more about Bearings, read our information on our Industrial Wiki and also be sure to check out our free Module of the Month, Preventive Maintenance, both available through the new odesie® site at http://www.myodesie.com/index.php/portal.